This building at 1129 Wharf Street and 15 Bastion Square was originally built in 1862. It was originally a single story building and the second floor was added in 1884-1885. For most of its history it has been used for warehouses, commercial or light industrial purposes. But since 1972, this building has been occupied by restaurants on the main level and nightclubs on the upper floor. This building was listed on the Canadian Register of Historic Places in 1975. 1129 Wharf Street, built in 1862 with additions in 1884-85. This building was built in 1862 by Joseph Johnson Southgate, who owned it between 1862 and 1905. It was originally a single story building; the second floor was added in 1884-85. In 1948, this building was purchased by Victoria firm, Wilson & Proctor Ltd., which operated its engine repair and machine shop business here until 1972. Wilson & Proctor was started in 1946 – in a garage at 860 Tulip Avenue in Saanich – by Howard Wilson and Bob Proctor. It was incorporated as Wilson & Proctor Ltd. in 1947 and the company bought 1129 Wharf Street – or 1125 Wharf Street as it was then – in 1948. 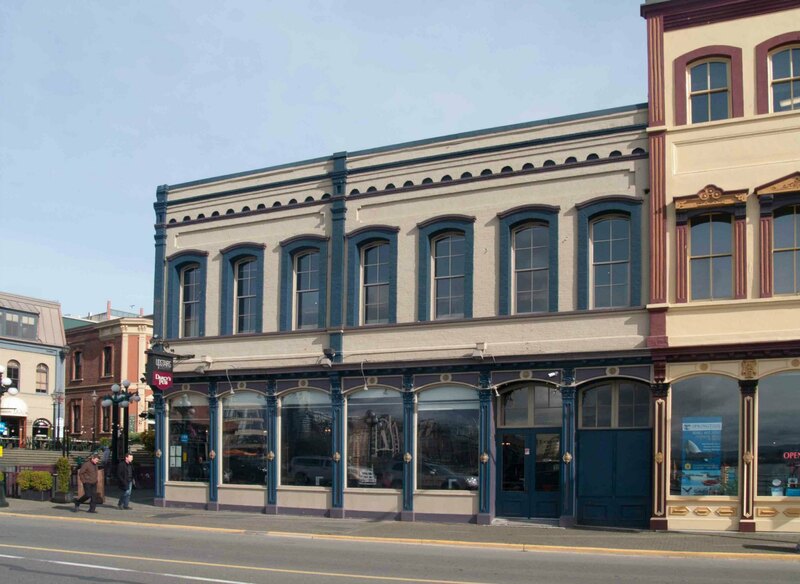 The company moved its operations into 1129 Wharf Street and occupied the building until 1972, when it sold this building and moved to its present location at 808 Devonshire Road. Wilson & Proctor Ltd. is still in business at 808 Devonshire Road in Victoria and kindly provided us with following photos. This photo shows 1129 Wharf Street circa 1962. Note that what is now Bastion Square (on the left of the photo) was then Bastion Street, which ran between Wharf Street and Government Street. The photo below shows 1129 Wharf Street circa 1966, when it owned by Wilson & Proctor Ltd. Note that Bastion Square had just been created – and Bastion Street closed – when this photo was taken. The photo below was taken on 26 March 1970 and shows the Wilson & Proctor Ltd. staff outside 1129 Wharf Street. Company founders Howard Wilson and Bob Proctor are second and third from the right. Note that the outside stairs to the second floor of the building were not there in 1970. Since 1972, this building has been occupied by nightclubs and restaurants. It was listed on the Canadian Register of Historic Places in 1975.